Peaches, apricots, and nectarines are flavorsome fruits, and by canning them yourself you can save a lot of money. Prepare canned peaches, apricots, and nectarines using a light syrup so that you can enjoy the full flavor of the fruit. Apricots make a sunny-flavored addition to winter meals. They make a great substitute for apples in an apple crisp recipe, too. You follow the same steps and cooking times for all three of these luscious fruits. The only difference is in the prep step: Whereas you have to peel peaches, you leave the peel on apricots and nectarines. To make a sweeter canned fruit, use a medium syrup. Wash your fruit. Meanwhile, bring the sugar syrup to a boil. To prepare peaches, peel them; then cut them in half and remove the pits. 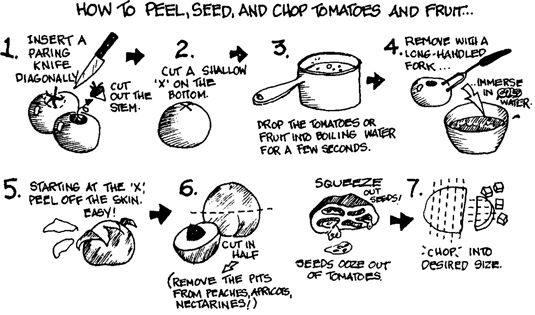 To prepare nectarines or apricots, simply cut them in half and remove the pits (leaving the peel on). To make peaches easy to peel, blanch them to loosen the skin: Dip them in boiling water for 30 seconds and then dip them in cold water. Pack the fruit firmly into hot jars and pour boiling hot sugar syrup over fruit, leaving 1/2-inch headspace. Release any air bubbles with a nonreactive utensil. Wipe the jar rims; seal the jars with the two-piece caps, hand-tightening the bands. Process the filled jars in a water-bath canner for 25 minutes (pints) or 30 minutes (quarts) from the point of boiling.